As an all-natural sweetener without any extra ingredients, honey already has a place in your kitchen but did you know there are many ways that honey can sweeten your beauty treatments as well? Benefits: Reduces puffiness, cools and refreshes contours under eyes. Stir honey into warm water. Blondes may wish to add a squeeze of lemon. After shampooing pour mixture through hair. Do not rinse out. Dry as normal. For a quick hair shine tip: add 1 teaspoon of honey to your bottle of shampoo or conditioner. Benefits: replenishes and adds shine to dry or damaged hair. Benefits: Aids in circulation of overworked feet. Moisturizes and softens while it soothes and restores tired aching feet. Mix all the ingredients together in a microwave-safe bowl. Microwave for two minutes or until the mixture just begins to boil. (Bowl may also be heated in a pan of water on a stovetop). Stir well and gently crush the berries. Cool mixture for five minutes and then strain through a fine sieve to remove all the fruit pieces. Stir again and set aside to cool completely. When cool, transfer into a small portable plastic container or tin. Apply a small amount to lips as needed. *Sweet almond oil can be found at natural food stores. Benefits: Protect sensitive lips from the drying winter elements with this simple yet rich lip balm. Delightful to wear alone or on top of your lipstick for extra shine! 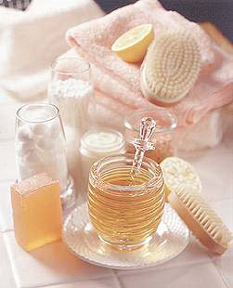 There are so many ways that Honey can improve your beauty routine and there are endless other uses as well. Add honey to your bottle of water for an energy boost during your next workout, the next time you come down with the flu, take a spoonful of honey as needed to soothe a sore throat, or before bed as a cough suppressant, and don’t forget to try it as a healthier alternative for sugar in many baking recipes.